Easton Baseball Bat Ghost Decertified! Updated Saturday May 5, 2018 by Registration Questions. 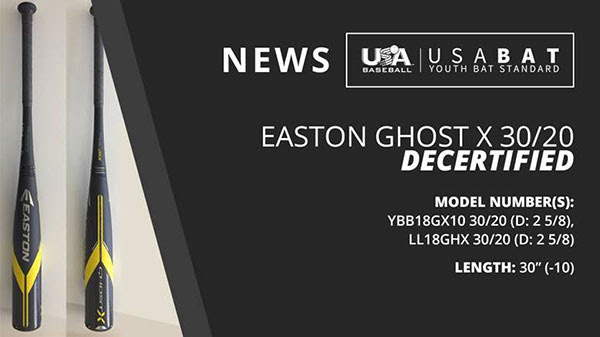 Any questions regarding returns, refunds, or warranty claims for the Easton Ghost X 30/20 should be directed to Easton at ghostreturn@easton.com. More information on how the USABat Standard impacts Little League can be found at LittleLeague.org/BatInfo. We apologize for any inconvenience and thank you all for your attention to this matter.